The NITRO 600, portable air filtration machine with impact resistant polyethylene housing and performance you have learned to expect of OmniAire equipment. The NITRO 600 is UL/CSA listed for your safety and to meet your high expectations and many project requirements. Nitro has been designed to give you the most performance, the most versatility and the most compact size. The safety yellow color and strong structural design sets it apart from the rest. All machines are using similar HEPA filters and some type of primary/secondary filter, but only NITRO offers four stages of filtration to match any requirement. NITRO is an excellent airfiltration unit for countless applications. It provides a safer, cleaner and healthier environment. • HEPA filter in NITRO will last longer and maintain it’s flow because of its stronger blower. 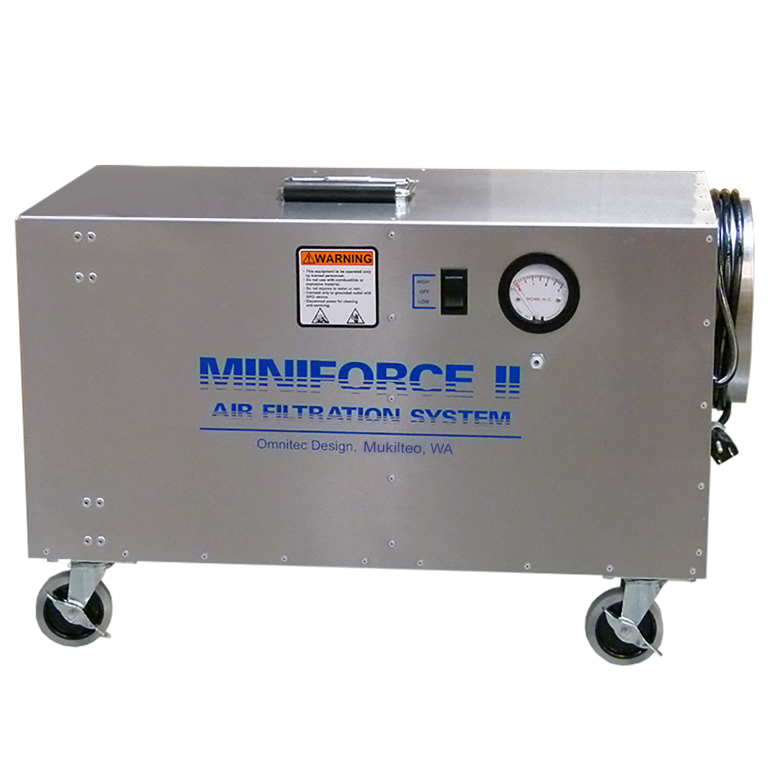 MiniForce II is designed for small containments and projects with difficult or limited access. Its portability and airflow capacity make it ideal for remediation onboard ships, crawl spaces, attics and many other projects. • Dimensions (L x W x H) : 26,5" x 14" x 16"
• Weight with filters : 43 lbs. 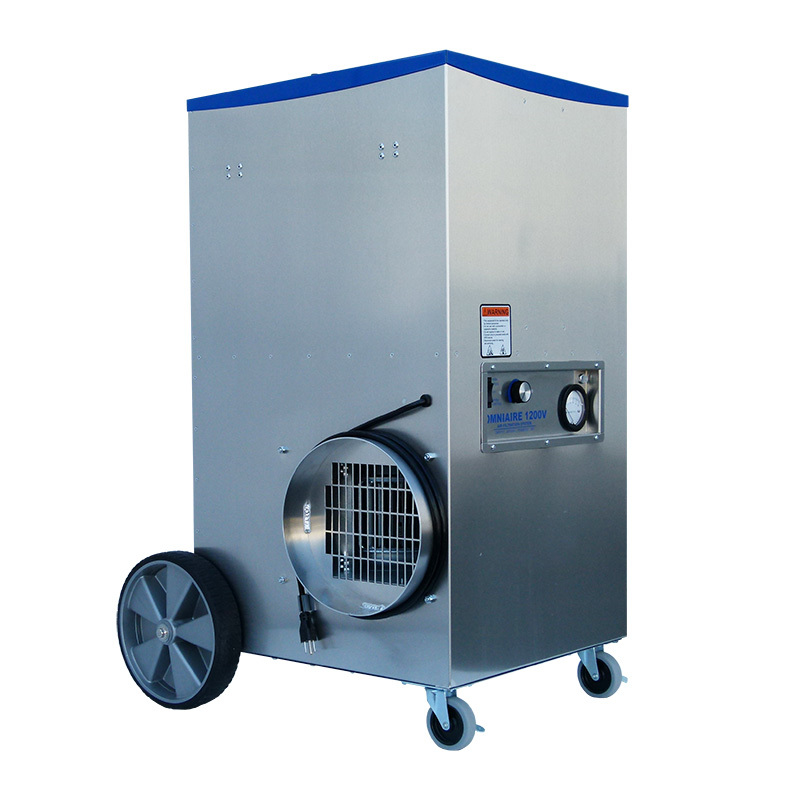 OmniAire 600V is our most compact air scrubber with a variable speed control. 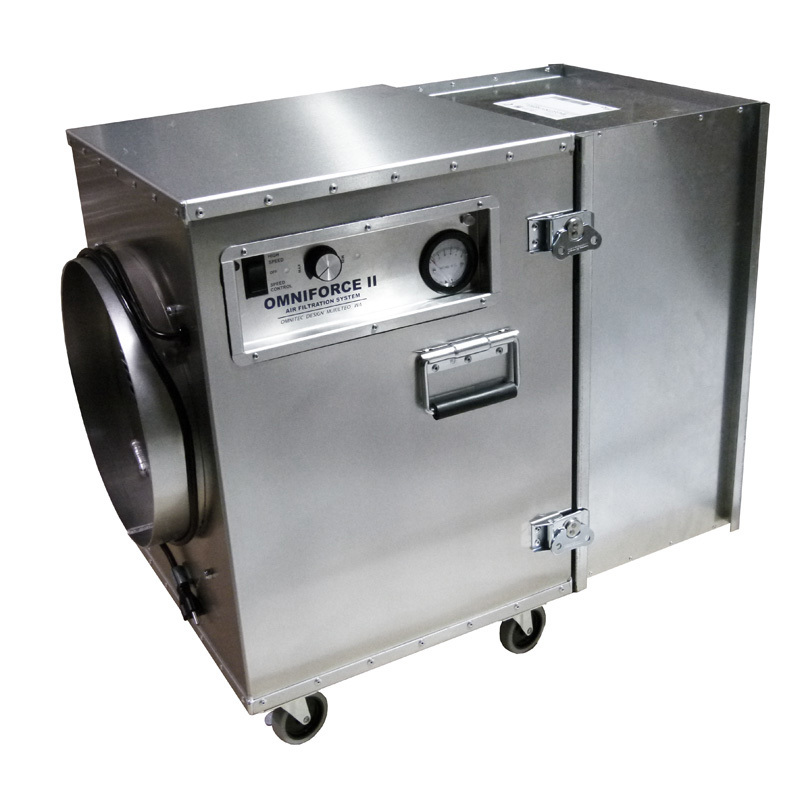 The unit is used for removal of asbestos, toxic mold spores and other hazardous waste at construction/ renovation projects and in industrial facilities. • Dimensions (L x W x H) : 30,5" x 14" x 18.5"
• Weight with filters : 55 lbs. 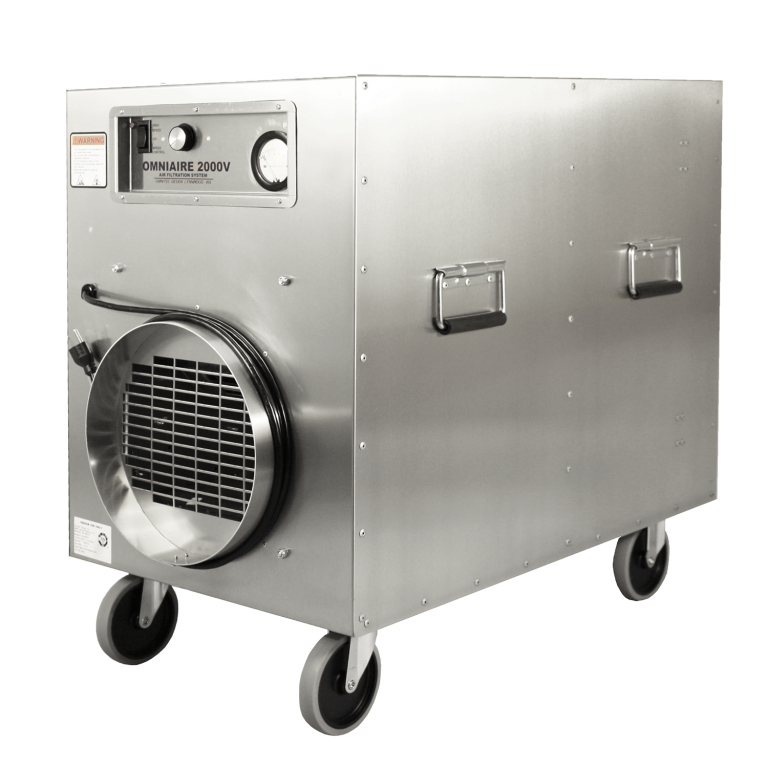 OmniAire 1000V is a mid-size, variable speed machine. Optional accessories includecarbon filter or UV germicidal light. It is used for removal of mold, asbestos and biocontaminants including virus & bacteria. • Dimensions (L x W x H) : 32" x 18" x 21"
• Weight with filters : 75 lbs. 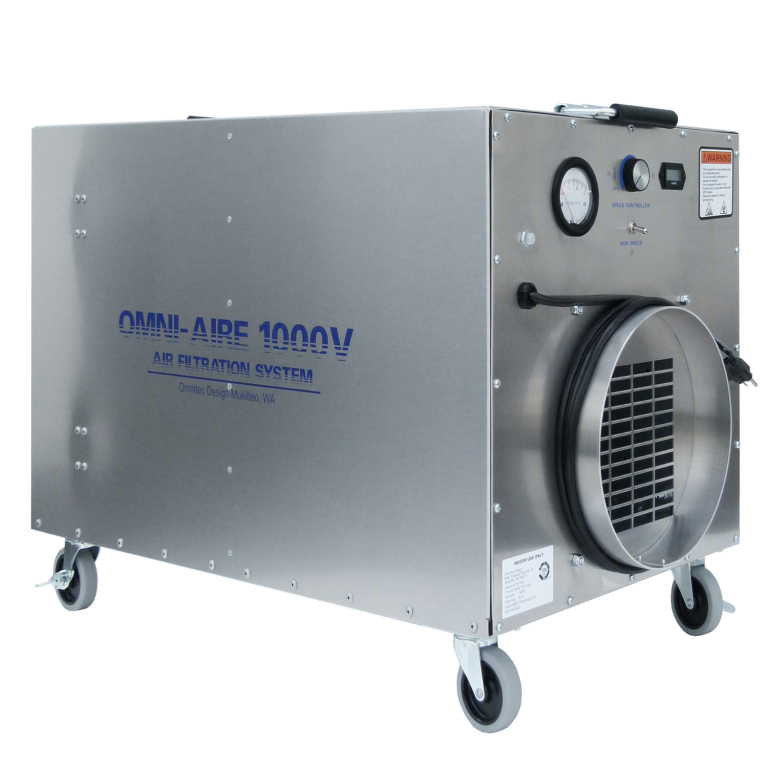 OmniAire 1200V is a variable speed unit with air flows of 150 to 1100 cfm. With large 10” rear wheels it moves easily up and down stairs and through congested spaces. Comes pre-wired to accept an UVGI module. • Dimensions (L x W x H) : 25" x 24" x 39"
• Weight with filters : 105 lbs. OmniAire 1300V is a narrow profile, variable speed machine. 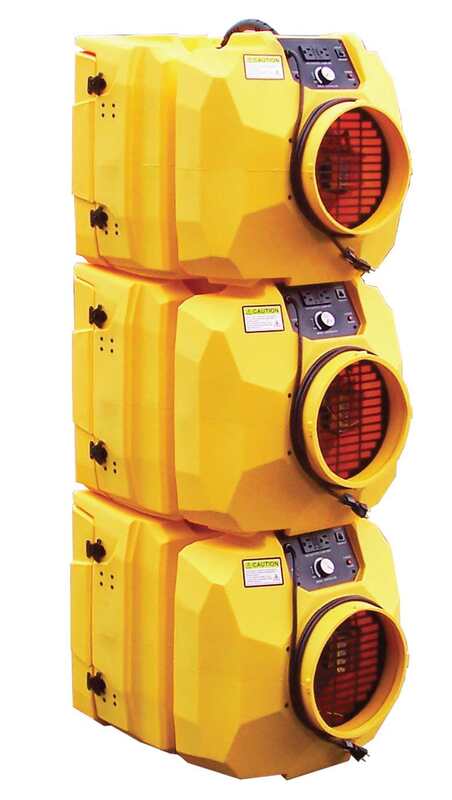 At just 14” wide it can easily be used in narrow hallways and other remediation sites where space is at premium. • Dimensions (L x W x H) : 33" x 14" x 29"
• Weight with filters : 90 lbs. OmniForce II is an extremely versatile machine. With a detachable external HEPA filter it is easily transported to and around renovation sites. • Dimensions (L x W x H) : 32" x 18" x 28"
• Weight with filters : 95 lbs. 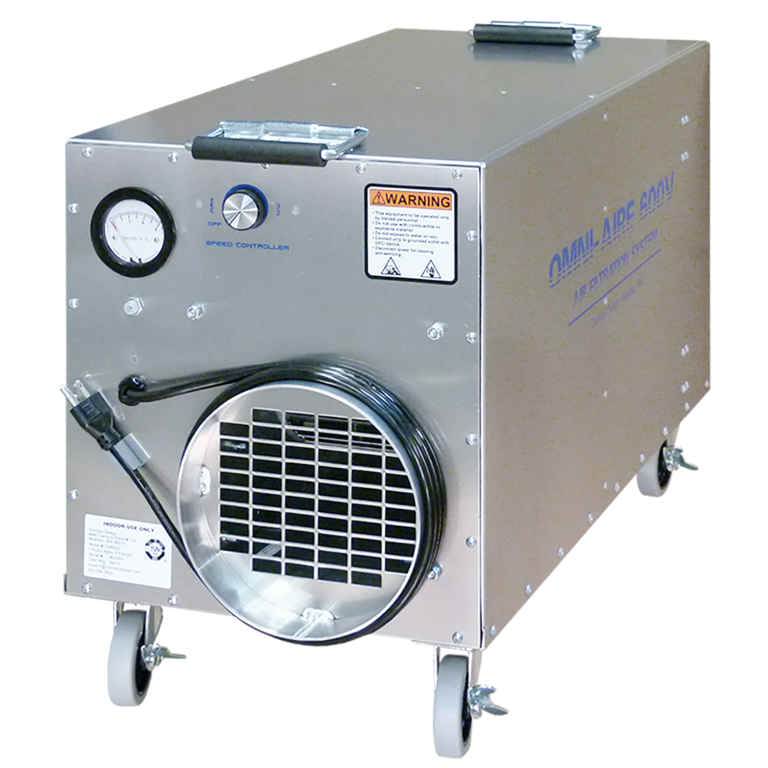 OmniAire 2000V is a variable speed unit with airflows of 300 to 1900 cfm. This high capacity unit moves freely through door and hall ways at construction/renovation sites. • Dimensions (L x W x H) : 34" x 20" x 29"
• Weight with filters : 110 lbs. OmniAire 2200 has three air flow settings for a wide range of applications. It has large 5” casters, smooth aluminum housing and epoxy coated metal base. • Dimensions (L x W x H) : 34" x 26" x 31"
• Weight with filters : 125 lbs. 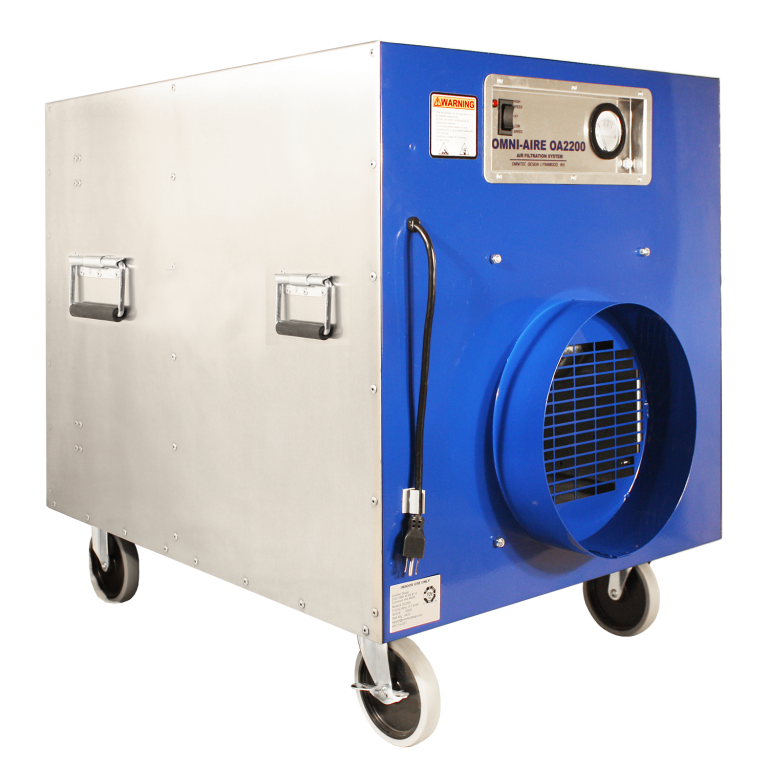 The OmniAire Portable Air Cleaner (PAC) machine 800 PAC with 99.99% HEPA and UVGI germicidal lights eliminates sub-micron particulates and microbial contamination. Designed for healthcare environments, it offers quiet operation as the air is exhausted through the HEPA filter. This unit has fully adjustable air flow and a small footprint. The OmniAire 1600PAC machine is used to provide either a positive or negative pressure in patient’s room, operation rooms and other environment sensitive areas. PAC can also purify and recirculate air in large patients waiting areas and other isolation spaces. 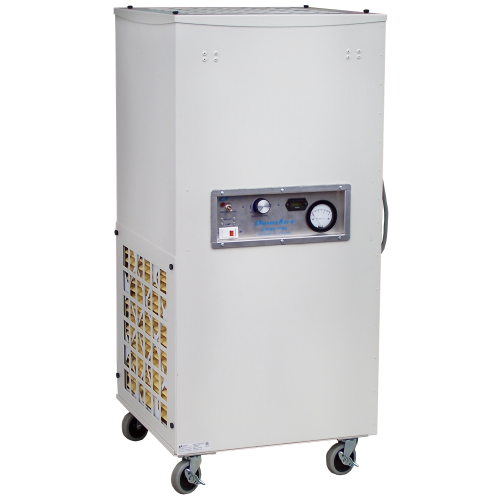 The OmniAire 1600PAC utilizes a combination of a medical grade HEPA filter and UV germicidal irradiation offers the highest level of protection for both health care professionals and patients. Depending on your environmental requirements, OmniAire 1600PAC Series machines offer an assortment of options for pre-filters, HEPA filters and accessories. 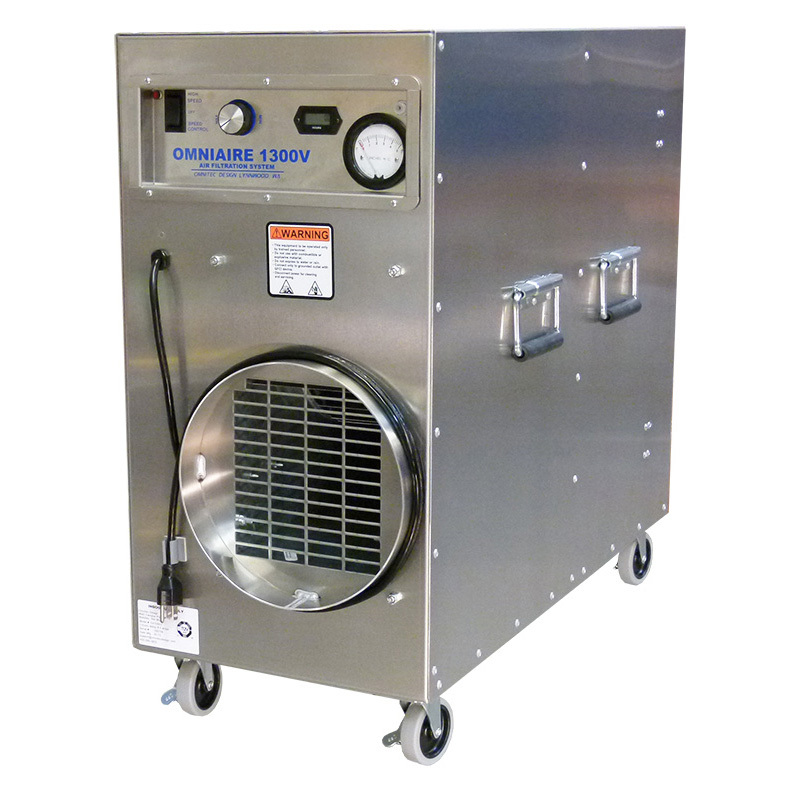 Our standard OmniAire 1600PAC machine ships with a MERV 11 pleated primary filter, UV-germicidal lights and a 99.99% efficient, .3 micron HEPA filter. Light weight and a small footprint. Comply with OSHA, UL and CSA/IEC electrical safety requirements. 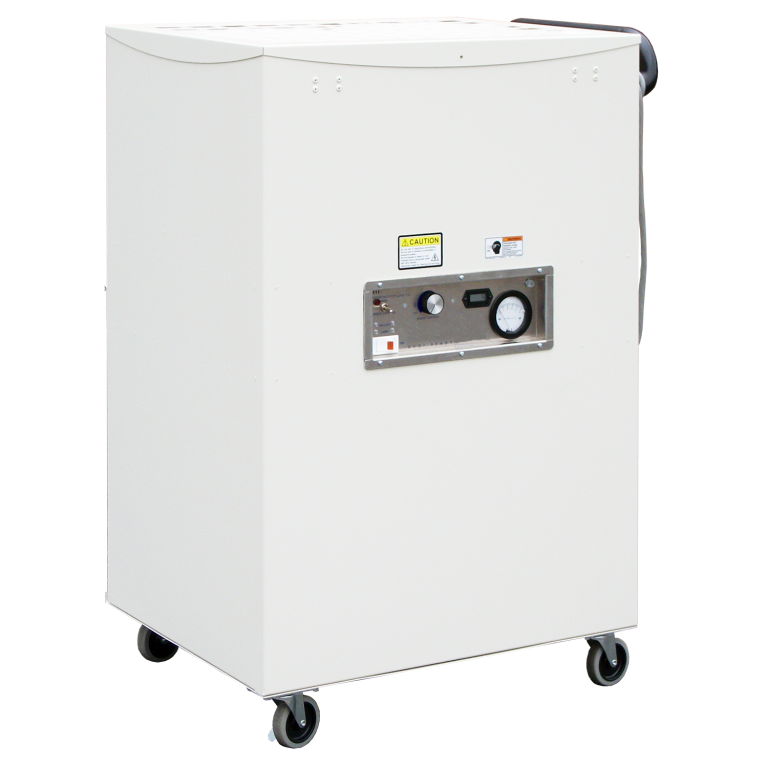 Optional PEROx air purifier module with hydro-peroxide and oxides plasma generator can be quickly installed for safe distraction of VOCs, odors, bacteria, virus and other bio-contaminants. The Hydro-peroxide plasma purifies not only the air passing thru but also the air and surrounding surfaces. The PEROx module enables a quick turnover of patient’s rooms and in depth purification without use of chemicals.